Forum users might like to note that Historic England's major report about Cliffe Fort is now available for download by following the link below. At 243 pages and an appendix I suggest you think before you press print! Happy reading. I think that Cliffe Fort should be saved, and it is disgusting that it has been allowed to fall into such a state of disrepair. (Its a shame that the owners cant be held responsible and made to foot the bill....sorry rant over). In addition to Kyns idea perhaps it would be suitable, or part of it suitable for some sort of out door pursuits centre, canoeing sailing etc. Alternatively part could be used by an organisation such as the RSPB as they have so many Reserves in the area. In my employment capacity, I've had several meetings and site visits with the owners of Cliffe Fort - Bretts, and took the opportunity to talk about the fort, I was told the fort is far too expensive to look after or renovate owning to constant flooding at high tide etc, there policy is to secure it from trespassers by building a security fence around it and leave it to the elements. Another issue is the entire area (from the fort, inland to Bretts yard, along sea wall onto higham marsh is to be left to rising tides as part of the T2100 projection of coastal erosion. as relaying the orders by word of mouth or was there some sort of mechanical/electrical system? According to Baker Brown, writing in the Journal of the RUSI in 1935, "The only vulnerable point was the observing station for the officer in charge, which was made very small and inconspicuous. The control was by electric dials. The switches which controlled the latter were combined with a pair of glasses, so that the officer could control the switches without lowering the glasses. Several plug points for the electrical connections were provided." Cheers for the reply David. Something I was just wondering and I can't find any definite information for it on the Web or in Beanse's book. 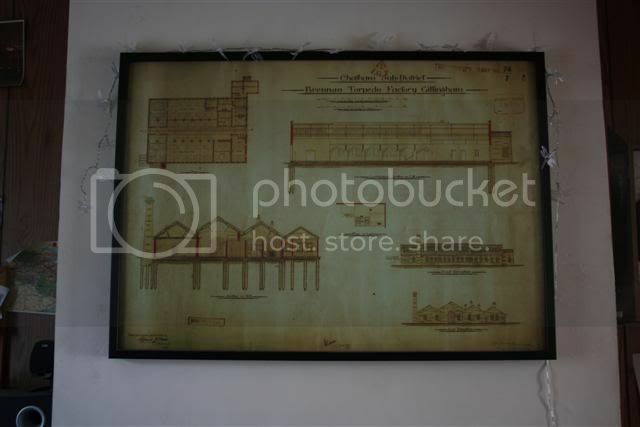 Does anybody know the location for Brennan's Factory in Gillingham? 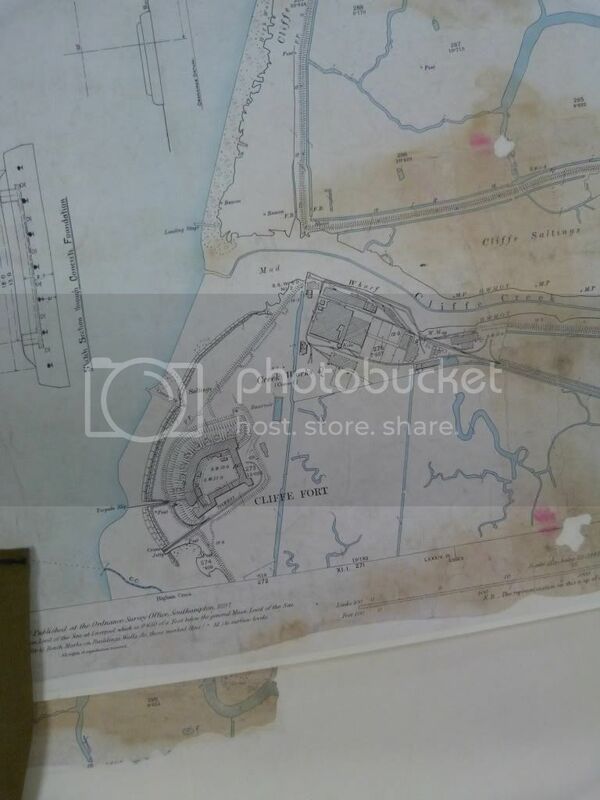 There is a plan for factory at Kew (WO 28/4415) but the information does not give an exact location. I was wondering if anybody else as looked into this. It does not give a location though. I believe it was down Pier Approach Road where the little industrial area is. Secure storage giving two floors of casemated rooms and tunnels that could be used or like Fort Horsted a secure business centre! The Gilkicker developer's plan gave the fort a secure future. The conversion was to take into account the history of the structure with greater opportunity for the public to visit than there is at present. In my opinion their attention to detail was brilliant. The plan ticked all the right boxes. Even the Environment Agency agreed that if the plans do not go ahead the fort has no future. Links to the proposals can be found on my Fort Gilkicker website. E.H. were fully supportive and the Local Council passed the plans only to have them called in by the Secretary of State because of Environment Agency's objection. Shortly after this the E.A. changed the reason for their objection. (Their original objection was because the sequence test had not been applied, but then they agreed it was not relevant to Gilkicker ) A five day enquiry (costing a huge sum of money) dealt with every little detail of the possibility of a 1 in 200 event causing a possible flood risk by the year 2070. I don't know how high above O.S. Datum sea level Cliffe Fort is but I should think it is on a par with Gilkicker. What was English Heritage postion of converting Fort Gilkicker to apartments? How extensive where the changes? Was the structure and key features to be retained, or as in the case of Fort Picklecombe, would it be complete gutted down main structure? As things stand, apartments would be a no, the location at Cliffe is not suitable, and I don't thing English Heritage would go for it or any of the other interested groups. Flooding is a problem, but it is believed that this is mainly due to the collaspe of the drainage system, although this due to be comfirmed. English Heritage are carrying a survey on site over the summer, to establish the extent of the deteration. However the initial indication are that the site isn't beyond use, and there is potential. The structure remains solid and there is no cracking or subsidence. The main issure is the constant traspassing, which while many are well intentioned, many are not, and there is the potential for a accident, which could pose a threat to the future structure. The main sticking point is the land owener and there use of the area adjacent. They have in the last few use invested resource in there facilities, so they intend to stay for a while, however there use of the area is restricted, because in addition to the reserve, there are at least 6 signficate Scheduled Monuments bordering the area of there activity. They may find that the become too cost to use so again that may change. What is definitly out is a Heritage Vistors Attraction in its own right, but I am saying too much...I trying to get peoples thoughts on what I posted at the begining. We have been through exactly the same scenario with Fort Gilkicker here in Gosport. There is no future for Cliffe Fort unless a viable modern use can be found for it. I cannot see it attracting any money for conversion to modern usage. The decay is too great. The one huge obstacle put in the way of converting Fort Gilkicker to apartments was put there by the very agency that should have been supporting the development, The Environment Agency. They have contested the application on the grounds that a rising sea level will make the Fort unsafe for future occupation. What will the future be for Cliffe? It will suffer the same problem with rising sea levels. Andrew401969: The problem with researching the Brennan Story is that most of the official documents have been destroyed. I know that Alec has found most (if not all) of the existing documents and many questions are left unanswered. Just how the directing station at Cliffe worked will remain a mystery unless a new source of information is discovered. 4-inch B.L.s were definitely fitted but the exact date and why I have no documents to support. Cliffe Fort, does it have a future? My interest in Cliffe Fort, is not specifically as a Fortification (although I am interested in the subject) but as a case study in Heritage Management, and specifically the issues relating to Schedule Monuments, where substantial remains exist. Cliffe Fort is clearly a good example, and is also at significant risk of being lost, and is listed on the Heritage at Risk Register. Now the question is, is what to do with Fort Cliffe, to ensure its survival and future? Clearly as people with an interest in History and Heritage, I would value your input and ideas on this, both specifically on Cliffe Fort, and the wider issues relating to managing and conserving large monuments. Cliffe is one of 5 surviving coastal forts in the Thames and Medway, the others are Coalhouse, Garrison Point, Hoo and Darnet. All are these are Royal Commission Coastal Forts, built in the same period 1860-70, and are casemented coastal batteries. Each is different in terms of layout and design. Slough also exist, but is substantially smaller than the other coastal forts. There are also remains of two others, Shornmead/Shornemead/Shormead (I seen it spelt differently in a number of sources, at Kew is listed under Shormead) and Grain. Coalhouse is already undergoing restoration and is open as a heritage attraction, and there are a further 5 fortification heritage attraction close by. These are Tilbury Fort, Newtaven Fort, Upnor Castle, Rochester Castle, and Fort Amherst and the Brompton Lines. All are either open as heritage attraction and or undergoing restoration to that end. Further, there are over 30 fortification sites in the area, not including post 1914 structures, where substantial remain exist or are know to survive underground. In the UK, there are additional substantial numbers of coastal forts of the same period of construction, of which Fort Nothe, and Hurst Castles are open to the public, the rest are either in alternative use, or derelict. Cliffe Fort, is privately owned, and lies in an area that is use commercially, and this involves the use of machinery and heavy moving plant. There are number of additional significant monuments in the area, included the Lime Kilns and Romano-British cremation and burial site (see Pastscape). 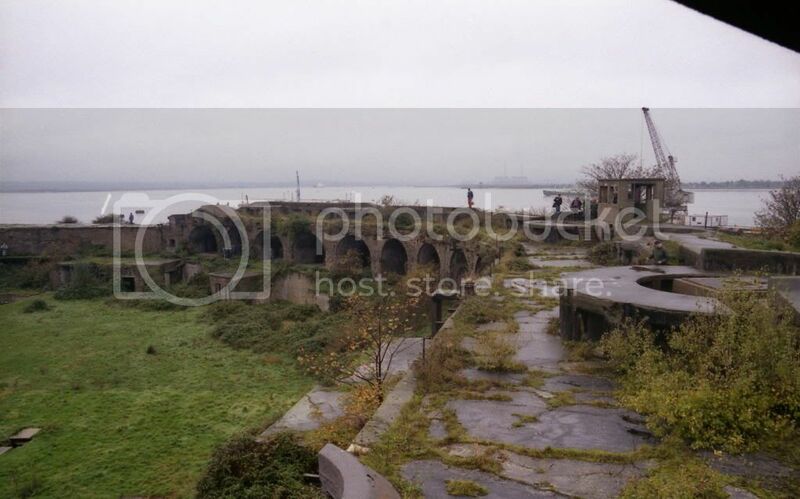 The fort lie within the area of The Thames Estuary and Mashes SPA and is a designated RAMSAR estuary and wetland, and there is the RSPB Cliffe Pools reserve next door. B. What do you think realistically can be down with Cliffe Fort? C. How could this be done? Thank you for taking the time to read this. I am working of hypothetical Heritage Management Plan, and while it is for a course, I am hoping that it might form the basis of something real, at the very minimum perhaps excite some interest in Cliffe Fort and its future.